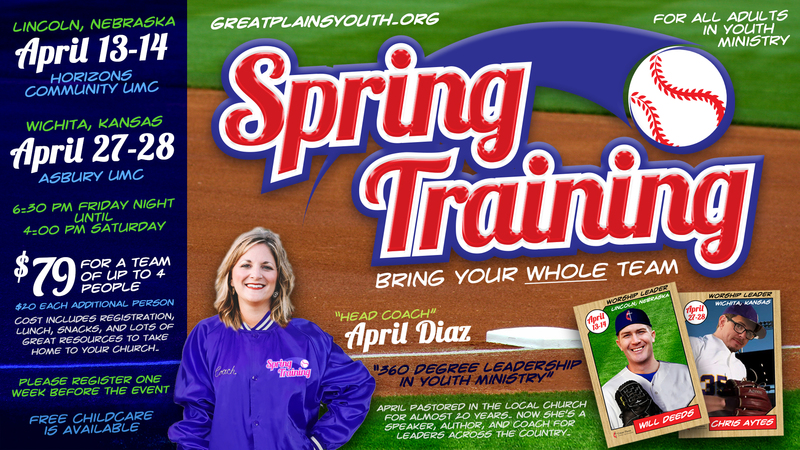 Spring training is designed for youth ministry teams. Bring everyone in your church who works with youth — pastors, youth leaders, Sunday school teachers, confirmation mentors and parents. Spring Training will be offered in Lincoln, Nebraska, at Horizons Community UMC, April 13-14 and in Wichita, Kansas, at Asbury UMC, April 27-28. Registration is only $79 for a team of up to four people. Registration includes lunch on Saturday, snacks throughout the event, and a bundle of youth ministry resources for your church. Free childcare is provided. Register for Spring Training 2018. View an article about Spring Training 2015.